Trump leaves after second day of the NATO Summit in Brussels, Belgium, July 12, 2018. Ye Pingfan/ Press Association. All rights reserved. Reading the news following US president Donald Trump’s latest passage through Europe the message was clear: it had been a bad week for the international order. 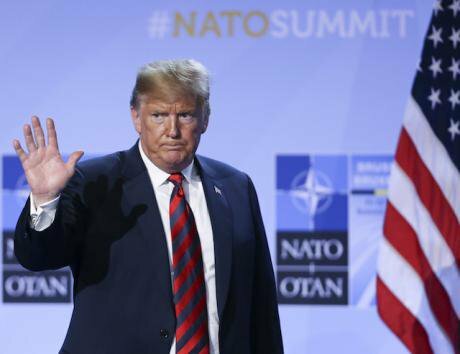 First Trump poured scorn on America’s allies for not contributing enough to NATO, allegedly even threatening to pull the US out of the alliance. This was followed by his much-too-chummy meeting with Russia’s president Putin prompting both liberal and conservative commentators to sound alarm bells at this bizarre spectacle. To top it off, Trump gave an interview to Fox News’ Tucker Carlson in which he used the unlikely example of Montenegro to claim that NATO is not only a flimsy excuse for a military alliance, but downright dangerous to the US. “Montenegro is a tiny country with very strong people,” Trump stated, adding that “They’re very aggressive people. They may get aggressive, and congratulations you’re in World War III.” All of Montenegro’s neighbours and potential adversaries are either NATO members, NATO protectorates, or participate in NATO’s Partnership for Peace. The international commentariat exploded in outrage not so much at Trump’s casual racism but at his apparently successive attempts to undermine NATO, either out of ignorance or at Putin’s behest. Yet instead of underlining the absurdity of the idea that a country with just over 600,000 inhabitants and an army of 2,000 could possibly start a world war many commentators chose to drum up the emotional charge with orientalising clichés. An assembly line of opinionated pieces warned the broader public of the chilling prospect of a renewal of the conflicts and wars of the 1990s should Trump withdraw NATO’s protective wing from a region that has been “prone to violence” and where, coincidentally, “World War I started”. What it boiled down to was Trump trying to scare an American audience out of an alliance with the bottled evil spirits of the Balkans, while his opponents tried to scare it into keeping those spirits bottled by the same alliance. What was missing though was any substantive reflection on the question of how Montenegro could possibly start World War III. In what follows we would like to offer a tentative answer to this question by exploring two scenarios based on historical analogy. While Montenegro’s government responded to Trump’s comments with prompt assurances of peacefulness and friendship towards the US, Trump unwittingly was right about one thing. As any fiscal inspector of the Ottoman Empire’s western borderlands would have told you, Montenegro is not an easy vassal to have. Not only was it nearly impossible to get it to pay up its share of the common budget, but for centuries it suffered bad press for launching cattle raids into the neighbouring lands. Today’s Montenegro has done a lot to clean up its act since it last raided Dubrovnik in Croatia in 1991. Yet the messy extrication from the carcass of former Yugoslavia left it with somewhat fuzzy borders. Neighbouring Kosovo still bristles at the agreement that conceded to Montenegro some 8000 hectares of prime uninhabitable mountain ridge, while the temporary settlement with Croatia over about one square kilometre of a peninsula that may or may not lay in the vicinity of some underwater gas reserves could blow up at any moment. The trouble with these potential adversaries is that one is a NATO member, while the other hosts a NATO contingent that outnumbers Montenegro’s army 2 to 1. In fact, all of Montenegro’s neighbours and potential adversaries are either NATO members, NATO protectorates, or participate in NATO’s Partnership for Peace. Does this stop the new and potential members from attacking one another? And should this happen, could such skirmishes blow up NATO? Not likely. The NATO Treaty provides no clue as to what the alliance should do in case of conflict among its members, but historical record does. Basically, make them negotiate. At least, that is what Greece and Turkey have been doing since the 1974 stand-off in Cyprus – with remarkably little involvement from NATO. NATO’s commitment to collective defence does not mean that any hot-headed action on the part of one member forces all others to rush headlong into it. Article 5 must be formally invoked and then consensually confirmed. More so, even then individual member states are free to decide the extent to which they wish to be involved. The closest any of the commentators had come to describing what Montenegro could actually do to stir up world-wide trouble is to darkly invoke World War I. A replay of that scenario in the NATO context would require the following three steps: first Montenegro upsets Russia in some way that the latter deems unforgivable, then all attempts at diplomatic mediation fail, and finally Russia retaliates in such a way that NATO feels obliged to go to war to protect its tiny but aggressive member. Muddying this scenario is the fact that for most of its history Montenegro has had stellar relations with Russia. And though official relations have cooled down due to Montenegro moving closer to the EU, this has not gone down too well with its population. NATO membership was hotly contested, and if the ratification bill weren’t frog-marched through the parliament amidst protests and a boycott by the opposition, it is not clear that it would have won the public vote. NATO membership was hotly contested, and if the ratification bill weren’t frog-marched through the parliament amidst protests and a boycott by the opposition, it is not clear that it would have won the public vote. Also, no one in Montenegro is crazy enough to risk open confrontation because in the big geopolitical battles small countries are small change, Article 5 or no Article 5. If a pro-Euro-Atlantic terrorist grouping were to arise and assassinate the heir-apparent to Gazprom during a brawl on the top-floor restaurant of a freshly docked cruise ship in Kotor, the perpetrators would probably be promptly served to Putin on a silver platter. If then Moscow still decided that it wants war, it would matter very little whether the young Russian Franz Ferdinand was assassinated in a Montenegrin marina or in West London. World wars take scale and scale takes the involvement of Great Powers. Princip’s assassination of Franz Ferdinand in Sarajevo is seen as the event that triggered the First World War. But the Balkans did not start World War I. It was started in Vienna, Berlin, St Petersburg, Paris and London as the governments and military staffs in the capitals of the Great Powers decided to act upon a set of alliances and treaties that led to mass mobilisation and declarations of war following Austria-Hungary’s instrumental use of the assassination as a pretext for war against Serbia. Does this mean a debate about the nature and workings of NATO should be off limits? Absolutely not. The purpose of the alliance is long overdue for a refresher. But instead of herding the small Balkan states into an alliance with an ambiguous potential to mediate regional conflicts and seen as a threat by Russia, it makes all the sense in the world to take stock of the complex historical legacies and geopolitical relations and figure out what kind of security system would work best. What doesn’t make sense is to invoke threats of World War III if or unless NATO stays exactly as it is.